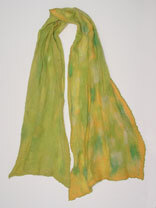 This scarf was made by first laying out the gauze silk scarf. Then tufts of roving in varying colors were layed out to cover the entire scarf in a single layer. The scarf was felted by the traditional rolling method and fulled by rubbing while flat on the rolling mat. Finished size: ~ 11" x 48"